The presentation piece is shown here with Tantalise and can be worn together as a matching pair. This necklace is designed for the woman who wants to ‘make an entrance’. It is dramatic, long, strong and interesting with a generous mixture of jadeite and jade (in a variety of shapes), Tahitian pearls, chrysoprase (in various cuts), apatite faceted rondelles, specially cut Tourmaline crystals, carved deep green aventurine melons and a bead pave-set with Tsavorite garnets and worked onto 18 KT yellow gold wire. 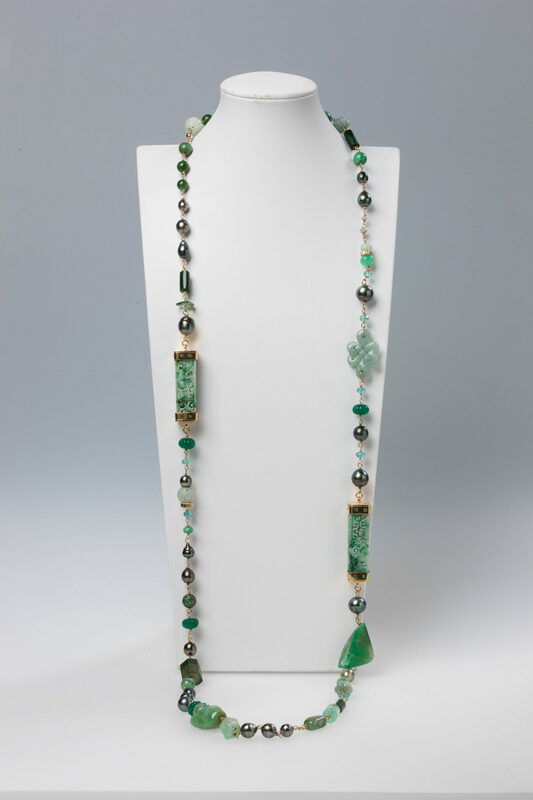 This long green jade necklace was conceived as an integration of Eastern and Western notions of aesthetics and politics (within a necklace). East (Burmese, Chinese, or Russian jade) and (Western culture: South Sea (Australian) or Tahitian pearls) is attracted to Western style; West is attracted to East. While there is a cultural element to the choice and carving of stone, the hand-wiring – the pulling it all together is of an organic nature.